"A deliciously mildly spicy ethnic-inspired salad that's very healthy as well. A nice crunchy twist on UNsprouted lentil salads." 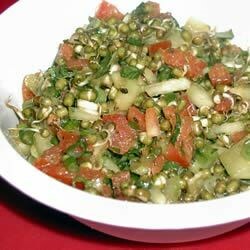 In a medium bowl, combine the lentil sprouts, cucumber, tomato, green onions, cilantro and radishes. Toss lightly. In a smaller bowl, whisk together the olive oil, lemon juice, white wine vinegar, oregano, garlic powder, curry powder, mustard, salt and pepper. Drizzle the dressing over the salad, and toss lightly to coat. Chill for 20 to 30 minutes to allow the flavors to blend before serving. Wow! I really love the mix of spices and herbs. Very refreshing, tasty and not to mention healthy! The sprouted lentils took two days to make. Which wouldn't be that big of a deal if the salad was superlative. It's not. I told my husband "this tastes healthy" which isn't a complement. Cucumbers weren't available, so I substituted asparagus, which was in season. I liked making the sprouts, and I liked the combination of flavors in this salad. Quite tasty! Healthy and delicious. Don't be tempted to make more of the dressing. The amount is perfect. Me and everyone at work loves this. great recipe! i added 1/2 tsp of smoked paprika. yum. I didn't care for this recipe, but I felt healthy eating it! I also used fresh oregano and resisted making more dressing as suggested. It is the correct amount. I added some frozen corn. May try some diced jalapeños next time fir a little kick.